Now that the bye weeks are in full swing, waiver wire pickups become that much more important. As I always say, championships are won on the wire, not in the draft. This was the week of Patrick Chung. Chung was initially benched in the 2nd quarter by coach Bill Belicheck, but was allowed back into the game after blocking a punt that led to a TD. He would go on to block a FG and return an interception for a touchdown. This should give Chung some well-deserved job security and is great news for us Chung owners. On the flip side of things, Michael Lewis was granted his release today after being benched in favor of rookie Taylor Mays. He's safe to drop in all leagues. Emerging fantasy sleeper Steven Gregory was busted for PED use and has been suspended for four games. Consequently, I will be keeping a close eye on the San Diego strong safety position as there is nice value to be had there. In Atlanta, William Moore remained the starter at strong safety over a healthy Erik Coleman. If you own Coleman, now is the time to dump him. Rookies Derrick Morgan and Morgan Burnett were both placed on IR after suffering season-ending injuries. Colts strong safety Melvin Bullitt will also miss the rest of the season after breaking a bone in his shoulder. 1. LDE James Hall (STL) @ DET - Chris Long was supposed to be the breakout defensive end in St. Louis this year, but in reality Hall has been their best fantasy lineman by a wide margin. He's had four sacks in his last three games and goes up against the Lions this week. He's a solid DL3 option moving forward. 2. RDE Haloti Ngata (BAL) vs. DEN - There are very few 350 pound players in the NFL that possess the balance and nimbleness of a ballerina, but Ngata is one of them. He's been wreaking havoc on opposing offensive linemen and is a every week must-start in DT-required leagues and is quickly becoming a reliable DE2 option. He's got a very nice matchup this week against the Broncos. 3. RDE Dave Ball (TEN) @ DAL - Dave who? Previous to this year, Ball had only registered a sack in one of his previous five seasons in the league. However, Ball has been playing well (4.5 sacks in the last three games) and is in line for ample playing time now that rookie Derrick Morgan has been placed on injured reserve with a torn ACL. RDE Charles Johnson (CAR) vs. CHI - Mike Martz' whack protection schemes were finally exposed last week in New York as the Giants managed to sack the quarterback a whopping ten times. Johnson has had a sack in each of his last two games and is a must start against the sorry excuse the Bears refer to as an offensive line. 1. LILB A.J. Hawk (GB) @ WAS - Some may call A.J. Hawk's big performance last week merely a fluke, but I would disagree (to a certain extent). Hawk's main issue the last two seasons was his departure from the playing field on subpackages. With Brandon Chillar currently injured, Hawk has been allowed to stay in for nickel snaps thereby increasing his tackle opportunities. Furthermore, Nick Barnett is going to be slowed a bit this year as he continues to struggle with knee issues and a recently sprained wrist. I'm not expecting huge numbers from Hawk, but he has LB3 value in most leagues and he's got three solid matchups in a row in Weeks 6-8 (Dolphins, Vikings, Jets). 2. SLB Brian Cushing (HOU) vs. NYG - Obviously, Cushing is not a sleeper. But sometimes players get lost in the shuffle especially heading into the fifth week of the season. If Cushing is on your league's waiver wire, makes sure and put a claim in for him. Judging my the numbers that Zac Diles put up early in this young season, Cushing is in for a very nice year. 3. MLB Dhani Jones (CIN) vs. TB - Jones is probably the least exciting pickup you will ever make, but he's an easy player to benchmark. On average, he's going to get you between 8 and 9 total tackles per game. He's got a nice matchup against the Bucs this week, so you can probably bump that production up to 10 or 11 total tackles. 4. SILB Akin Ayodele (BUF) vs. JAX - Ayodele filled in for the injured Andra Davis last week and came up with 4 solo tackles and 6 assists. Assuming Davis is out again next week, Ayodele is a decent play in deeper leagues as there are plenty of tackles to go around on Buffalo's defense. NOTE: Please check and make sure Davis is not playing before you pick up Ayodele. RILB Keith Brooking (DAL) vs. TEN - Brooking is on pace for his best fantasy season since 2007. This is in large part due to him staying on the field in nickel packages this season. In the previous two years, Brooking was replaced on third downs by worst linebacker in the league, Bobby Carpenter. Now that Carpenter is in Miami being Bill Parcells' boy toy, Brooking has been seeing an increase in tackle opportunities. He has a fantastic matchup against Chris Johnson and the Titans this week. I see nice LB2 value for Brooking in Week 5. 1. SS Taylor Mays (SF) vs. PHI - This kid is a playmaker, plain and simple. It's a rarity to find a safety who is 6'3", runs a 4.3 40, and hits like a MAC truck. Mays got the first start of his career last week and put up 11 total tackles and also caught a blocked punt for a touchdown. Previous starting strong safety, Michael Lewis has been granted his release from the team, so Mays should have the starting gig locked down for the rest of the year. He still struggles in coverage, but for our (fantasy) purposes, this is good news. The 49ers will be bringing him up close to the line of scrimmage on a lot of plays as an extra defender against the run. I don't like the matchup that much against the Eagles this week, but Mays is going to be a very solid option at the defensive back position over the course of the entire season. 2. SS Donte Whitner (BUF) vs. JAX - At the onset of the regular season, I pointed out Whitner's potential value. He plays behind a very leaky front seven and consistently has above-average tackle opportunities. He's had 23 total tackles the last two weeks and as long as he can stay healthy, that production should continue. 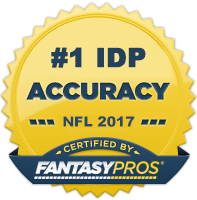 He won't get you many big plays, but he has low DB1/high DB2 value in tackle-heavy leagues. 3. RCB Alterraun Verner (TEN) @ DAL - After Roman Harper was listed as inactive for last weekend's game, I quickly scoured the waiver wire in my "big money" league for a potential gem and came up with Verner. I honestly had him in the back of my mind all week and I just forgot to include him in my waiver wire article (sorry about that). He's in an optimal situation; he's a young, talented, but very inexperienced cornerback playing opposite a Pro Bowler in Cortland Finnegan. Teams are going to pick on him relentlessly. We saw this last week as Kyle Orton continuously threw in Verner's direction resulting in 11 solo tackles. I expect more of the same this week from Alterraun as he faces Tony Romo and the Cowboys who are currently allowing the most fantasy points to opposing cornerbacks. 4. LCB Terrell Thomas (NYG) @ HOU - T-squared has been quite consistent so far this season. He's registered 4 or more solos in each of his first four games to go along with two interceptions. I tend to trust this production as he had 70 solo tackles last season. He has a nice matchup against the Texans this week. Andre Johnson should play and Thomas will be covering him for a majority of snaps. He's a nice play in CB-required leagues this week. RCB Greg Toler (ARI) vs. NO - Toler has been one of this year's biggest surprises as he has already racked up an impressive 30 solo tackles, 2 forced fumbles, and a sack. In their attempt to avoid Dominque Rodgers-Cromartie, teams will continue to throw at Old Greg and he should continue to put up very nice tackle numbers. This week he has a very juicy matchup against the high-powered New Orleans Saints offense who are typically quite gracious when it comes to handing out points to opposing fantasy CBs (e.g. the all-but-dead Richard Marshall put up 9 solos against them last week). Start Toler with confidence this week in all leagues. If you want a little break from the Fantasy Football articles, click here to read my latest "Rants" article.